Mascara is one of those staple pieces that even those who wear minimal make-up will usually have. Everyone’s got a mascara or two (or twenty if you’re me!) laying around right? I like to think that I’ve had a good amount of testing experience with mascaras, because I’ve tried so many in search of the perfect one. (I wrote a post on my Top 5 High-end Mascaras.) This means that I usually know quite quickly when trying one out whether it’s going to be any good or not. In the sake of keeping things fair, unless one is absolutely pants, then I’ll usually give it a good go before making my final verdict. But the sad truth is that for me, I’m hard to please with mascara. Unless it really wows me then I’m unlikely to repurchase and will usually just end up seeing out the tube as a bottom lash mascara, while I switch to something else for the top. Sad but true for all the ill-performing mascara out there. 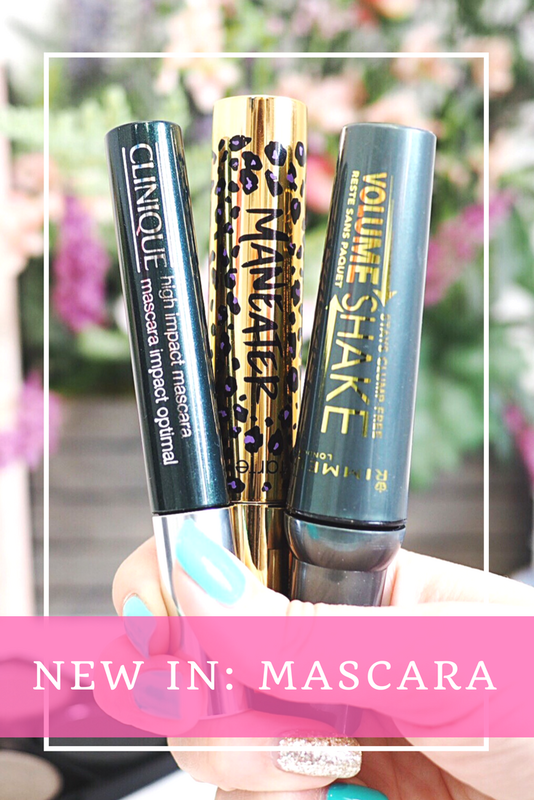 So there have been three new mascaras that I’ve been trying out recently and I’m excited to tell you which were the hits and which were the misses. Having long thin lashes means I need my mascara to hold my lashes up all day, which is quite hard to find. And I like the false-lash look on a daily basis – without actually wearing false lashes. So lift and thickness is essential for me too. If there’s no lift and hold, it’s not likely to be a hit for me. But between these three I’ve been able to try a good variety of mascaras and find a couple I really rate. So if you’re looking for a new mascara, hopefully one of these will tick your boxes.. The first one is a high-end mascara, which always means I have higher hopes for it’s performance. Doesn’t mean I always get it, but usually my expectations are higher with a bigger price tag and this one is £19. I got mine in the Tarte Maneater set recently which made it more affordable, but £19 is about what you’d expect to pay for a high-end mascara. Hence why you’d expect a bit more from it. I’d been wanting to try this because I previously used the Tarte Amazonian Clay Mascara and I loved it, so I was really excited to see if their ‘up to 23x more volume’ claims were true. The brush is a a standard brush with short bristles, which always ensures a good coating of the mascara on your lashes because it stops the product getting lost in long bristles. It’s a thick-end wand and it goes on really easily. The mascara itself is deep black without being gloopy but the short bristles do mean there’s some clumping as you apply when the product is wet. The trick is to apply a minimal amount of product without dipping the wand back in the tube, this ensures you get more than enough mascara on the lashes, and then as the mascara is transferred you can brush it out more, to stop the lashes sticking together. I used this mascara solidly and I’m still enjoying using it now. It gives great thickness and volume to the lashes and the coverage is great with only a little bit of mascara needed. With this one it’s all about brushing it out after you’ve applied, so it’s all in the technique. I can’t say I see 23x more volume, but definitely a good increase in volume and thickness and it has great hold throughout the day too as my lashes don’t droop when wearing it either. I actually really love how this is working for me, it gives me everything I need and I’d definitely re-buy this. Get this here. Next up is the Rimmel Volume Shake Mascara which I know a lot of bloggers have been trying recently. When I got my hands on this I was really excited because it’s supposed to contain a new in the mascara market – it’s got the first ever shaker system which is supposed to ‘re-activate’ the volumising formula when you use it. Which sounds like a good thing right? For a drug store brand the mascara is very reasonably priced at £8.99 which is very appealing to pretty much everyone. And I saw so many rave reviews on it that I was genuinely expecting to find the first drug store mascara in ages that was going to blow my socks off. But sadly that wasn’t the case… The pro’s of this are that it is completely clump free, the brush has softer bristles which are longer than the Maneater mascara and the amount of product that comes out each time is a lot more too. The colour is okay, but considering so much product comes out on the brush, it needs a lot of coats to look thick and make lashes appear coated. From the first time I used this I knew it wasn’t going to work for me. There was zero lift what-so-ever. My lashes are curved naturally, hence why I need a strong mascara to hold them up. But this straightened my lashes out – so they looked like the were sticking straight forwards, with no shape at all. The lack of lift or volume was really unimpressive and I felt like my eyes were naked all day when wearing this. It did literally nothing for my lashes, and if anything, I felt it made my eyes look worse. So sadly for me this is a big no-no. It’s not even made the cut for a lower lash mascara. Fortunately I did like the wand and how it brushed the lashes, and that’s the only reason why it didn’t come out of my little trial with a zero. Another high-end mascara that I’ve been trying out recently is the Clinique High Impact. I realised when this arrived that I’ve never actually tried a Clinique mascara before, so I was all excited when it came to giving this a go. Plus it sounded like my kinda mascara – it’s supposed to boost your lashes with maximum volume while also thickening them out and separating them too. For £17.50 this one sits in the expected price bracket for high-end mascaras so I had high hopes again. This one has been really nice to use and I can say that it’s a really lovely everyday mascara. The brush is gorgeous as well, with bristles that coat your lashes as they go and the product itself is thicker than the Rimmel one so you don’t need to apply coat after coat just to feel like you’ve got enough on. A couple of layers of this is plenty and you’ll get the maximum out of it very quickly. It’s a really thickening mascara, which I love. My lashes look thicker and fuller using this and there’s no clumping either, which means you can put it on in a hurry and know you’ll still get the maximum out of it. I wouldn’t say I get the false-lash effect from this, but what it does do is separate my lashes nicely while adding volume, which gives the really pretty fan style look to lashes that you can’t go wrong with. It doesn’t smudge, you can apply it in a hurry and it’s got a good amount of hold. It might not give the fake lash look, but to be fair that’s not what it’s designed for, but I still really rate this for performance. So those are the three new mascaras I’ve been using on trial, and I’m pretty impressed with the Clinique and the Tarte one. Even though the Rimmel failed to impress me, it may work for you if your lashes are thinner. But overall if you’re looking for a new mascara go for the Tarte or the Clinique!